Through the story of photographer Jair Cabrera, directors Elpida Nikou and Rodrigo Hernández Tejero present this jolting, unforgettable film about violence, corruption, and organized crime in Mexico’s capital. The star of Disparos, Jair feels most passionate about photographing the neighborhood in which he was born and raised— Iztapalapa, the most populous borough of Mexico City, ridden with widespread crime, due, in large part, to poverty and drug cartels. The talented photojournalist captures the beautifully vibrant parts of Iztapalapa, such as its colorful festivals, but mostly focuses on the borough’s darker facets, like its crime scenes and widespread gang life. To Jair, these more menacing aspects of Iztapalapa are merely a part of daily life, as many of the friends he grew up with ended up in the gangs. It’s a burrough that faces many difficulties due to violence and a lack of opportunities, but for me, it’s home. It’s everything to me,” he reflects. With his frank, purposefully unnerving photography, Jair showcases the parts of Iztapalapa that many would avert their eyes from. To him, however, averting his eyes is impossible, as the frequent killings serve as a troubling reminder that he or his loved ones could have easily been the victims. Yet, in spite of facing constant threats to his career— not to mention his life— Jair uses his work to open people’s eyes to the rampant violence and injustice he and his neighbors are forced to live with. 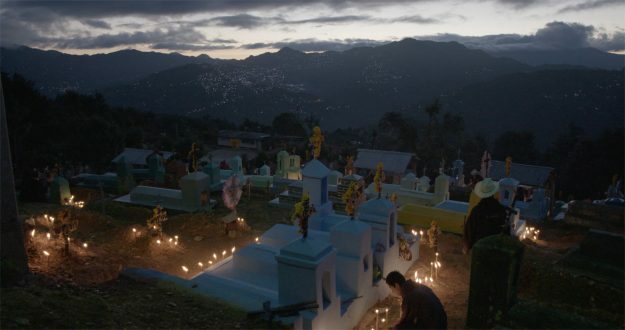 Showing the lives and struggles of both Jair and Jesús, the film powerfully demonstrates the tension between hope and despair in one of the deadliest countries to be a journalist. In the midst of ever-evolving crime and a government that has been shown to contribute to it, Jesús considers education and the arts an opportunity to rise above the gruesome reality many young people get sucked into: “We are at war, through education and culture, against the cartels. Who’s taking more young people, culture or cartels? That’s our war. We’re trying to lure in as many young people as we can. Let’s shoot millions of times, but with a camera.” Jair, however, somberly confesses at the end of the film, “I thought I could change something, but they stole that from me and told me that it was not possible,” referring to the Mexican government and the organized crime group that detained him and his colleagues. Disparos is a heart-rending, potent testament to education’s capacity to empower people in the margins of society, as well as to the formidable danger one faces while trying to change a cruel, unforgiving system. Unafraid to delve into the depths of anguish and hopelessness, faith and raw emotion, this documentary brings up more questions than answers, exposing the grueling battle to maintain hope amidst the ever-present threat of violence.